The European Central Bank handed 45.3 billion euros ($50.9 billion) to euro-area lenders at a zero interest rate, in the second round of its program to boost credit to the real economy. The take-up in the targeted longer-term refinancing operation, known as TLTRO-II, compares with a net 31 billion euros at the last operation in June. The cost of the four-year loans could drop as low as the deposit rate of minus 0.4 percent if the banks expand credit supply, meaning the ECB would be paying financial institutions to take its cash. 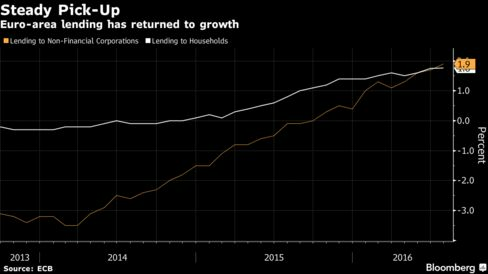 The program, which allows banks to borrow according to the volume of loans they issue to companies and households, is part of the ECB’s push to boost euro-area lending and help spur economic growth and inflation. Its importance may rise as the central bank’s asset-purchase program approaches its current cut-off date of March 2017, and policy makers consider how to cope with the risk of bond scarcity. Strategists at BNP Paribas SA predicted demand at the latest TLTRO-II would be around 20 billion to 30 billion euros, noting that banks used the first operation to restructure their funding. The take-up may have been affected by Italian lenders, who are facing pressure from European regulators to clean up their balance sheets and cut an estimated 360 billion euros of non-performing loans as the nation’s economy struggles to recover. ECB President Mario Draghi said on Sept. 8 that the ability of monetary policy to generate loan demand has “never worked better” and that the TLTRO-II and its previous, less-generous TLTRO-I predecessor are helping banks’ balance sheets. Lending to non-financial corporations in the region rose 1.9 percent in July from a year earlier, while credit to households climbed 1.8 percent. Still, the Governing Council has also raised concerns about an apparent correlation between banks’ equity prices and their willingness to lend. An index of euro-area bank stocks has dropped more than 25 percent this year.